The PetSafe Wireless Dog Fence offers safety and portability and is the first electronic pet containment system with instant installation. Completely wireless - Keeps your pet in your yard with no stakes, flags or wire to bury! The Petsafe Wireless Fence is the safest, simplest form of pet containment ever. The Instant Fence operates using the same principles as an underground fence, yet is completely wireless. This wireless fence sets up in an instant and is completely portable, so it's great for travel or when you move into a new home. 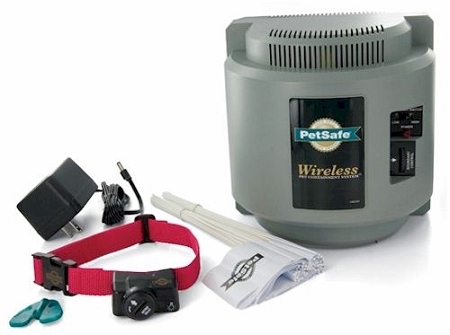 The PetSafe Wireless Fence uses a constant radio signal to create a "stay zone". The receiver collar worn on your dog picks up the signal. If your dog ventures out of the "safe zone", which is very rare once he is properly trained, he will hear a warning tone, followed by a light, static correction which startles your dog, but is completely safe and humane. With a little training that is simple and quick, your pet learns his boundaries and will stay safe at home. Setting up the boundaries of your yard takes only a few minutes by adjusting the range on the transmitter, from a radius of just a few feet to up to 90 feet. The Wireless Dog Fence Collar has Six Levels of Programmable Correction so you can customize the correction level to meet your dog's unique training needs. Only PetSafe offers this flexibility in a Wireless Dog Fence!